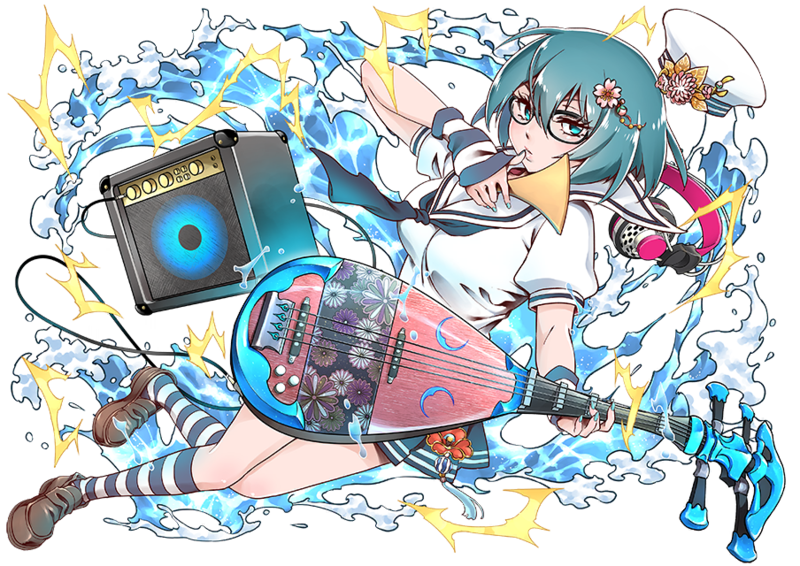 I'm Benten, a rock singer of the Light Music World. I'm a bit of an enthusiast, so you better get ready! Benten-sama, on stage! I'm gonna leave you behind if you're not in on it! Get on with the flow! Praise Pain Flux, Harahvati Aredvi! This is my skill with the biwa! Do you want to make an awesome living? Get up to date, and don't get caught in the waves! An artistic high school girl with an interest in subculture who is also a celestial maiden living in Nakano Ward. She is excessively confident in her own aesthetics and is also somewhat off-balance, mentally. Her hobbies include taking selfies and going to trendy cafés, vintage clothing stores, and art galleries. She constantly brings up her glory days as a goddess on the treasure ship and insists on being a guide to your party. She is good at influencing others but is also easily influenced herself, and very jealous, to boot. Her sworn enemy is a certain doujin artist from the Akihabara Guild. They have a habit of calling each other names such as Geeky Loser and Wannabe Non-conformist. An artistic, subculture loving girl and high schooler heavenly maiden from Nakano Ward. As she is overly confident about her sensitivities towards herself, she is a bit mentally unstable. Her hobbies are taking selfies and going to fashionable cafes, secondhand clothing stores, and galleries. She talks of an old tale of her time on a treasure ship, guiding the main party's ship, and she easily gets caught up in the flow of things. In addition, she has an unusually deep jealous streak. A certain doujin author from the Akihabara guild is her sworn enemy, with whom she trades abuses of "subculture poser girl" with "otaku freak." Her Sacred Artifact in form of stringed instrument called a Biwa possesses the Rule of Fluidity, wich can change the flow of all things. The effective range applies not just to fluids but also to abstract concepts like luck. She is also susceptible to being swept up in that flow, resulting in unpredictable outcomes. She's a high school student who struggles constantly with the conflicting desire wanting to ride the flow and dislike of being influenced by any outside force. Her school has a focus on art and she aspires to be a trandsetting artist. She harbors respect for and is interested in anyone with a strong sense of self who rejects the influence of others. The Sacred Artifact she possesses, her biwa, has the power of "flux," the ability to change the flow of things. The scope of this is not limited to just fluids, as it can also include abstract things like luck. However those current can also involve herself, so there can be unforeseen consequences happening. Her feelings of wanting to get onto the latest trends and of not wanting to get swept up are constantly clashing within her. She admires artists who create their own fads, and she attends an art school. She holds great respect and interest for those who never get swept up by anything. In Japanese Buddhism, Benzaiten is the patron goddess of artists, writers, dancers etc. She is usually depicted carrying a biwa. She's pretty good in all situations (because Bind and Dazzle) and doesn't particularly synergize with anyone. That said if you are lucky enough to have 5* Aizen, the two of them would make a devastating Bind team and increase Aizen's damage output. If you don't think Benten is amazing I will engage you in gentlemanly fisticuffs. She is a special "Event Item Character", like Yule, Sitri, Zao and Kujimuna. You need to got to the "Event Item Exchange" store and trade the itens you get for his version 3 and 4 stars. She was available during the "Set Sail!" event. 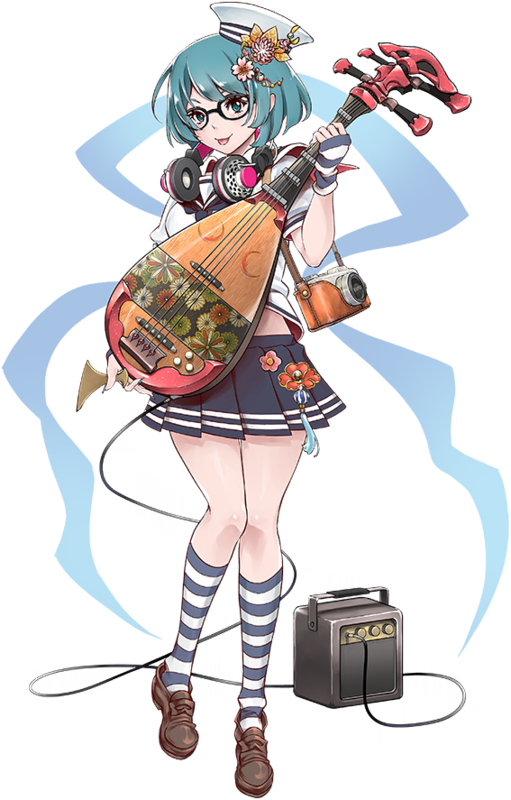 Probably she will return in this new event "Make Sail!". Someone please explain to me how to get this girl. I did past event and 2 special quest of Eita and Ganglie. I don't have Makara, Typhon and Ahab and her ^^. Do i need summon other 3 to do special quest and get her. I'm a f2p and newbie with this game too. I do reroll and try 10 summon and get 9/10 3* and none of them appear in banner. I did it on 3 reroll account and one of them have 2 copy of Makara. Maybe the rate is not that good or they forget to rate up those unit ^^. This page was last edited on 20 December 2018, at 16:54.